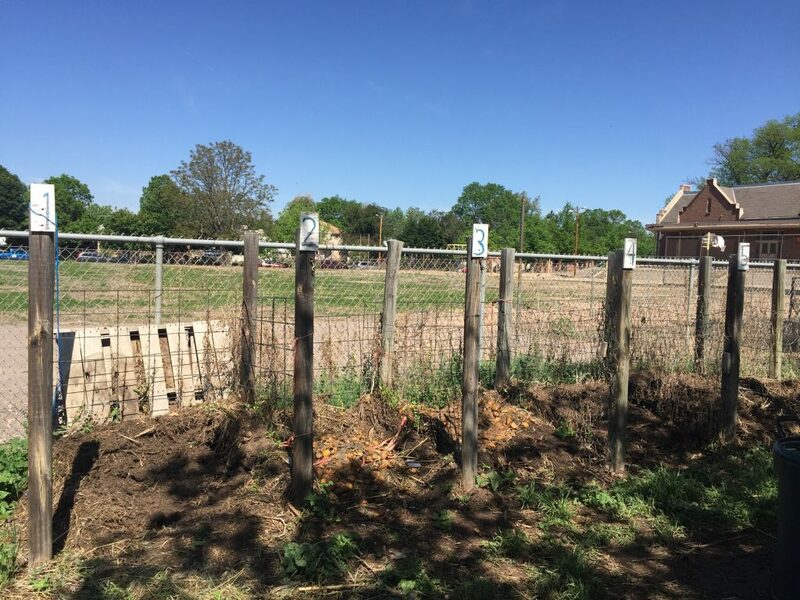 Page 3 – Building community, one urban garden at a time. 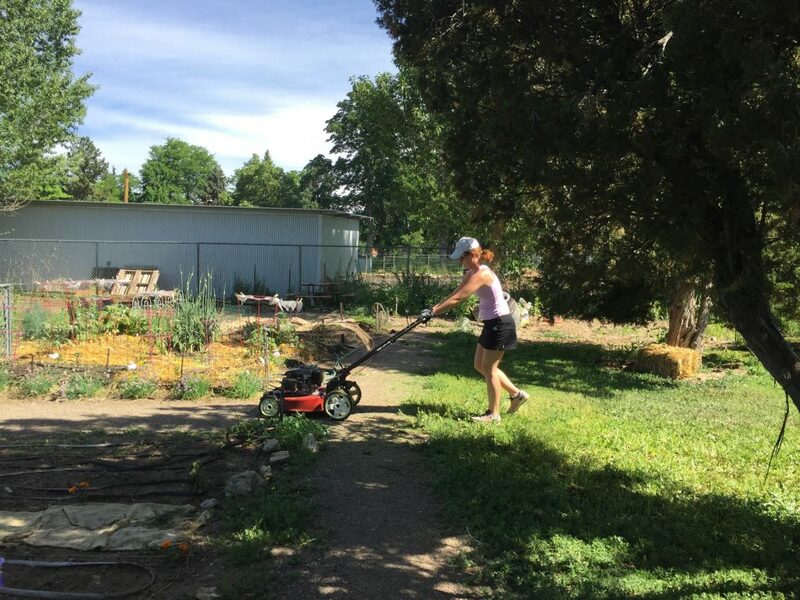 Trishia, who has been doing great work tending the herb garden this season, shares a few natural remedies using herbs and medicinal plants. In the garden, we know purslane as a weed, but it is completely edible and very nutritious, containing more Omega-3s than any leafy vegetable plant. It also contains vitamins A, C, E, and B, as well as dietary minerals such as magnesium, calcium, potassium, and iron. All parts of the plant are edible: leaves, stems, flowers, and seeds. To me, the flavor is relatively mild, with a bit of a lemony taste to the leaves. The stems are tender and have a more earthy flavor. There’s a recipe for Purslane and Cucumber Salad in the new cookbook, Bianco, from Pizzeria Bianco in Phoenix(if you have never been, their pizza is fantastic! ), and I was inspired to finally try eating purslane. You’ll be happy to learn, it’s fabulous. Plus, harvesting and weeding in one fell swoop is really pretty handy. To prepare the purslane, rinse thoroughly to remove any grit from the garden, then dry in a salad spinner. Pinch off large bunches of the leaves, no need to stem, and toss them in your salad bowl. 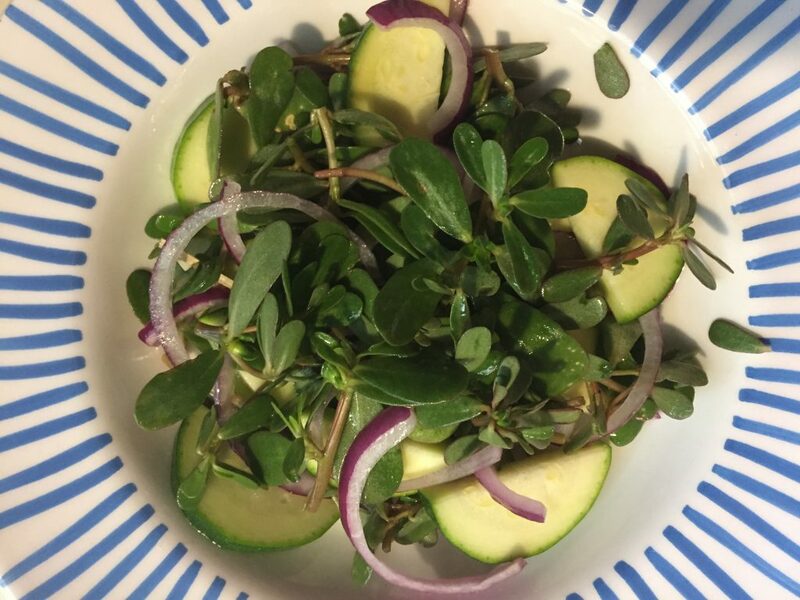 Since both purslane and cucumbers are readily available in the garden right now, this is a perfect salad to use as an introduction to this edible weed. A simple lemon dressing, some thinly sliced red onion, and you’re done. I didn’t grow cucumbers, but zucchini worked just as well, as would anything else you like to use in your salads. If you Google “purslane salad”, it’s amazing how many variations pop up. To think we’ve all just been tossing it on the Bokashi pile. Maybe we should bundle it up and sell it at the Harvest Sale. Hmmmm…. Join Milan Doshi on Saturday, August 5, from noon to 1:30 pm, as he provides an introduction into the wonderful world of fermentation. Participants will learn about the basic history and benefits of fermentation, and then will salt, mix and make their own batch of kraut to take home! Milan is chef and founder of the Five Points fermentation company and a DUG board member. Space is limited, sign up now! This class is free. Click on the Events Sign Up tab in the top menu bar. Search the calendar for Saturday, August 5. Click the box for the Fermentation Class. Click on the orange Sign Up box on the right hand side; in the pop up window, click Sign Up. You’re done! See you there. If you have any questions, contact Priscilla at plots@rosedalegarden.org. The Roberts family pours off that sweet, sweet Bokashi tea. Left to right: Natalie, Finn, Kevin. 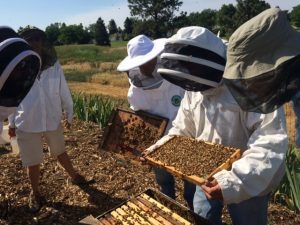 Devin Egger, with Bee Mindful, will be helping us with all of our bee hives, providing mentoring and giving the gardeners a bee class this summer! 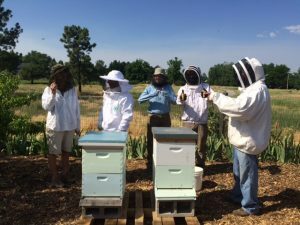 He will be at the garden every couple weeks, so if you see someone new working with the bees, it’s probably Devin, please give him a Rosedale welcome! 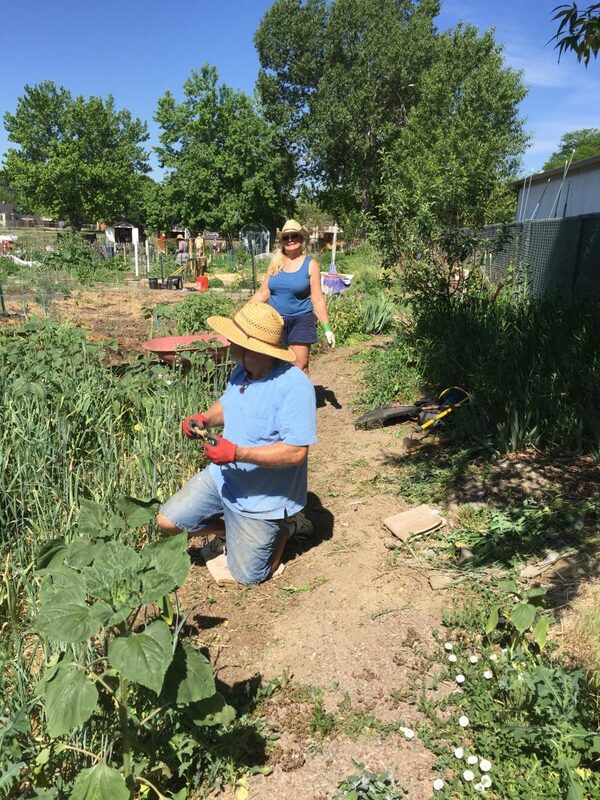 Many thanks to everyone who came out on this VERY hot day to help clean up the garden. Weeds, weeds, weeds! 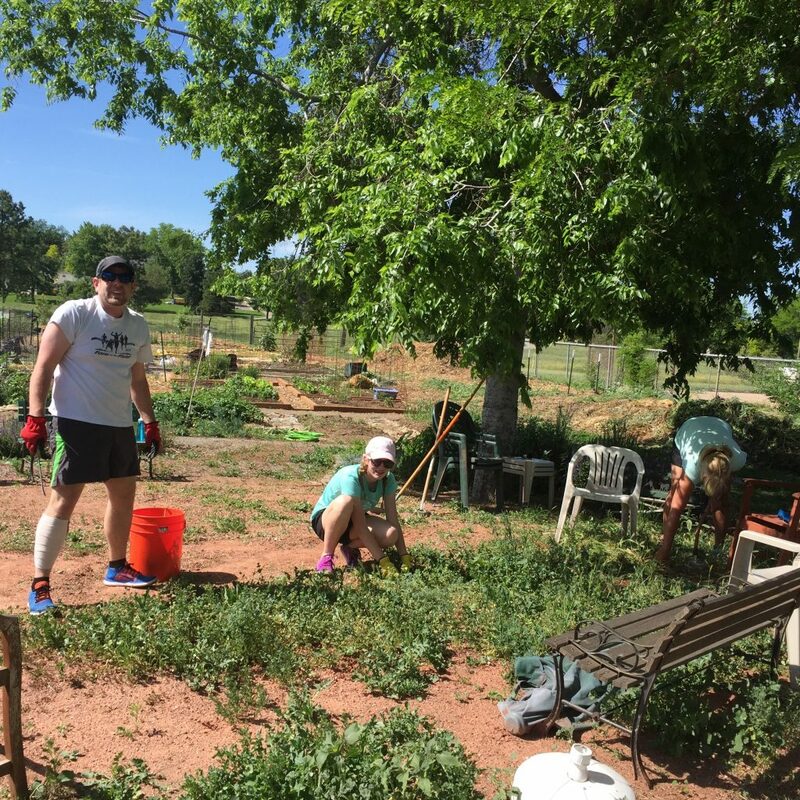 No one’s favorite chore, but all that weeding made a big difference in how the garden looks. Adam, Sidney, and Ana weeding the meeting area. Ugh! What a chore! 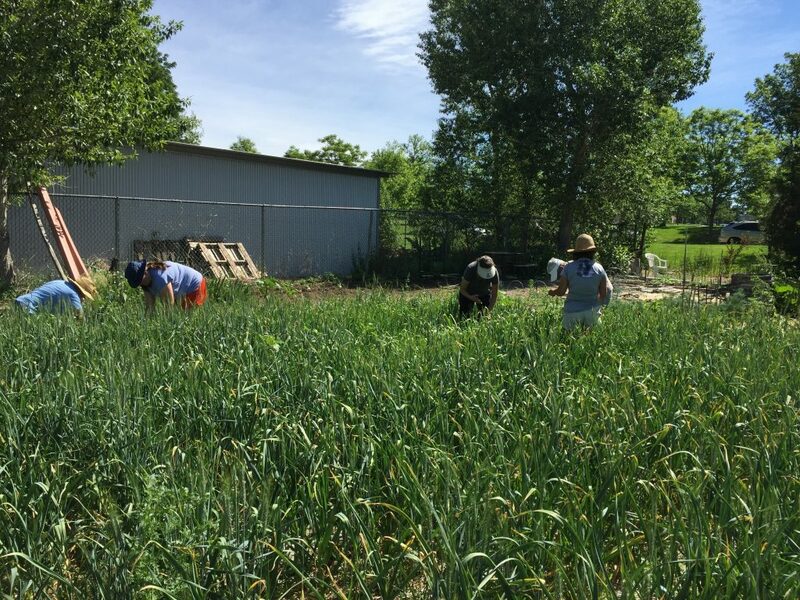 Sissy, Helen, Paula, and Paul harvesting garlic scapes and attacking the weeds. Double Ugh! But on the plus side, scapes. Yum! Charlie R. and Kris battling the weeds on the north pathway. Triple Ugh! 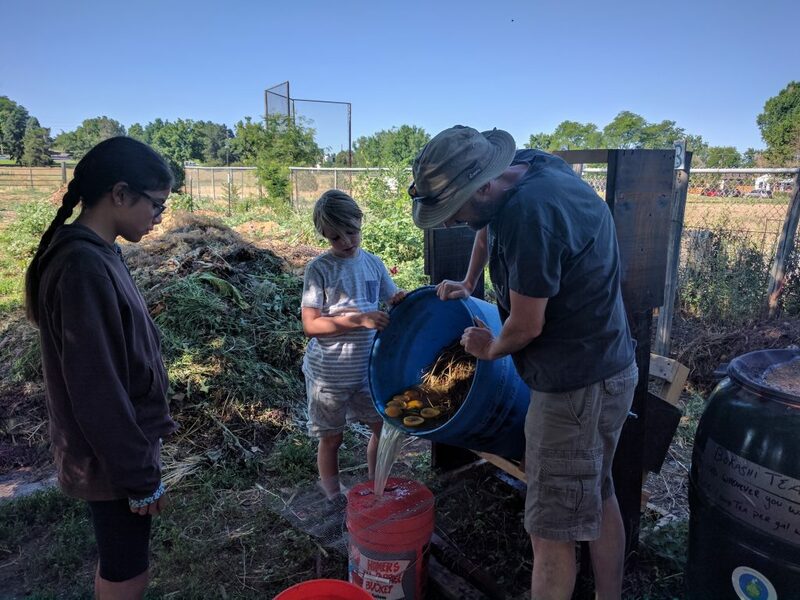 The bokashi composting project is now running on a regular schedule. If you have not yet been scheduled for a Saturday bokashi session, you will be soon. You may also schedule a session for yourself by going to the hours website here. Sign in, click on the Events Sign Up tab in the top menu, search through and click on any of the bokashi dates on the calendar, and sign up. We have a new, green 60 gallon rain barrel with a spigot, perfect for dispensing all the sweet, sweet, bokashi tea you would like. Use it as often as you like, as we will be refilling the barrel weekly with each new batch of bokashi. The tea can be used to water and feed your garden as often as you like. It is recommended that you dilute the tea in a ratio of 1 cup tea to every 1 gallon of water. You can use the tea every time you water, just weekly, or any schedule you like. Ideally, the green barrel will be empty by the time we need to refill on Saturday. Bokashi in process is in the blue barrel(Do Not Open). Bokashi tea is in the green barrel. Use the tea as often as you like. Bokashi in process is in the blue barrel(Do Not Open). Bokashi tea is in the green barrel. Use the tea as often as you like. The bokashi solids are a perfect compost to work into the soil in your garden. Worked into the soil, the solids will completely break down in just a few weeks, and add important nutrients to your soil. It also helps to aerate the soil and helps the soil to retain moisture. You can collect the solids any Saturday while the barrel is being emptied, or take solids from any of the wooden bins pictured below(numbered 1 through 6) behind the bokashi barrel. Ignore the numbers, they are a vestige of a long ago composting effort. The bokashi solids are dumped randomly into these bins on a weekly basis as the barrel is emptied and refilled. The bokashi barrel(s) is/are filled on a weekly basis with the weeds and plant material that have been placed in the pile in the back of the garden. 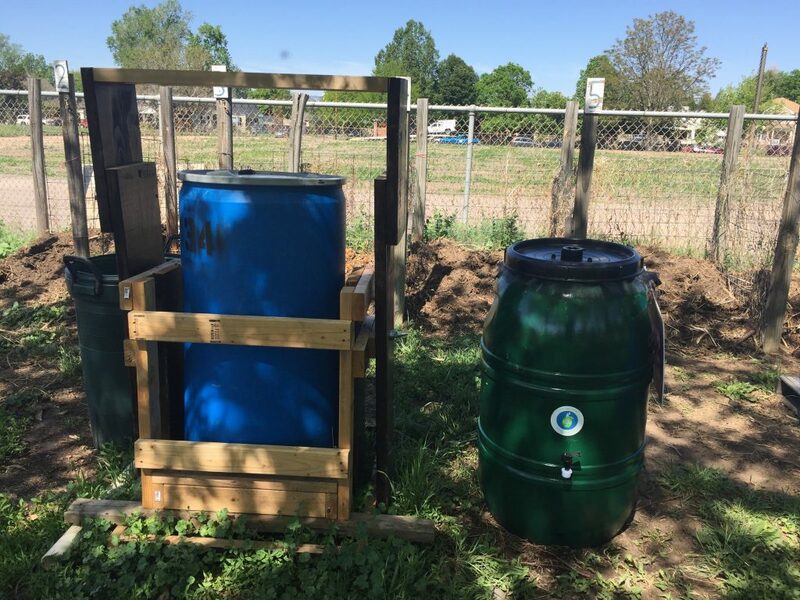 The barrel(s) is/are emptied each week, the rain barrel is filled with the tea, and the solids are placed in the wooden compost bins. The bokashi process takes 7 to 10 days to complete. We are currently operating on a weekly schedule, Saturday to Saturday. Please, under NO circumstances should the barrel be opened at any time other than during the Saturday bokashi session. Opening the barrel interrupts the bokashi fermentation process. Please, DO NOT attempt to tip the barrel at any time other than during the Saturday bokashi session. The filled barrel weighs over 300 pounds and could be dangerous if not handled properly. If you have any questions, please contact Priscilla at plots@rosedalegarden.org.